Kenzo Takada was born 27 February 1939 in Himeji, Japan is a Japanese fashion designer. He is also the founder of Kenzo Paris, a worldwide brand of colognes, skincare products and clothes Himeji or Hyõgo is a city located in Hyõgo Prefecture in the Kansai region of Japan. Takada's love for the fashion industry developed at an early age, particularly through reading his sisters' magazines. He shortly attended the University of Kobe, where he felt bored and eventually withdrew, against the will of his family. In 1958, he joined a fashion school, Tokyo’s Bunka Fashion College, which just opened its doors to male students. Soon after he earned his diploma, he settled in Paris in 1964. He was trying to gain a place in the fashion environment; attending shows, making contacts with the media while selling sketches. Takada designs started because he could only afford to buy his fabrics from flea sales. As a result, Kenzo had to mix many bold fabrics together to make one garment. Kenzo's success as a fashion designer started in 1970: during this year he presented his first show at the Vivienne Gallery; his first store, "Jungle Jap" opened; and one of his models appeared in the cover of ELLE. In 1974 his collection was presented in New York and Tokyo Japan. The next year, he won the Fashion Editor Club of Japan's prize. Kenzo proved his sense of dramatic appearance when, in 1978 and 1979, he held his shows in a circus tent, finishing with horsewomen performers wearing transparent uniforms and he himself riding an elephant. 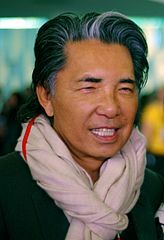 Kenzo Takada retired in 1999, leaving his assistants in charge of his fashion house. However, in 2005 he reappeared as a decoration designer presenting Gokan Kobo ("workshop of the five senses"), a brand of tableware, home objects and furniture. After a few years off, he wanted to take a new direction, stating "when I stopped working five years ago, I went on vacation, I rested, I traveled. And when I decided to work again, I told myself it would be in decoration, more than fashion." L’eau Par Kenzo for men launched in 1998, with exciting fragrant notes of ho leaf, yuzu, lotus flower, sweet lime, green pepper, ozonic notes, water pepper and white musk. Kenzo Air for men was introduced in 2003 with mystical notes of anise, bergamot, Haitian oil of vetiver, amber, grape fruit and nutmeg. Tokyo for men launched in 2007 with unique mix of notes which include green tea, orange, cedar, pink pepper, ginger, grape fruit and nutmeg. Kenzo Amour for women launched in 2006 with notes of blossom rice, fragipani rice, vanilla, white tea, cherry blossom, thanaka wood and frankincense. Kenzo Summer for women arrived in 2006 and boosted notes of citron, bergamot, violet, mimosa, musk, styrax wood, cetron, amber and almond milk. L’eau Par Kenzo for women launched in 1997 with extraordinary notes which include, lilac leaves, reed stems, mandarin, vanilla, water lily, pepper from Guinea, white peach, amaryllis, blue cedar, floral musk and wild mint.